At Saybrook’s August 2010 residential conference, I participated in the generative and strategic dialogue seminar facilitated by Dr. Nancy Southern, Dr. Kathia C. Laszlo and Dr. Alexander Laszlo of the organizational systems program. 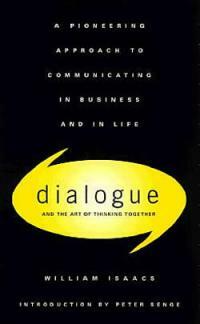 Learning about the difference between discussion and dialogue was particularly transformative and deepened my understanding of the concept of “thinking together”—at work, at home or in the community. This learning enabled me to better understand why some discussions I engaged in the past were so exhausting, energy depleting and, at times, painful. I understood the makings of a conversational beat-down at work, at home, or in the community. I understood how I have contributed to “beating down” on others’ spirits and how others have contributed to “beating down” on my spirit at home, at work or in the community. The seminar’s assigned readings—David Bohm’s 1996 book On Dialogue and William Isaacs’ 1999 book Dialogue: The Art of Thinking Together as well as Dr. Southern’s communicative competence model and perspective on hermeneutics and the Laszlos’ writings on evolutionary systems design—helped me see all of this. Even more eye-opening was the realization that—on my part (and the same probably goes for most)—my intentions were never to “beat down” on anyone’s spirit. I thought that I was doing what needed to done—to convenience others of my point of view; to win others over. I now know that I was operating from and within a sphere that Bohm would attribute to a failure to “suspend,” which made “proprioception” impossible. Proprioception would have presented a mirror that might have enabled me see a reflection and the results of my thoughts and thought process. All in all, my learning from the dialogue seminar greatly informed my way being with self and others and helped me see the potential and possibilities of applying dialogue as a real intervention in my life work. I am more attentive to my assumptions, reactions and opinions. More and more, I am learning to listen deeply for understanding, suspending and refraining from defending and instead seeking to create spaces where “shared meaning” can sprout and thrive.